Three years ago, I presented a case study on the impact of mobility on workforce productivity in an industry enterprise mobility summit. While enterprise mobility is a broad topic, I kept my focus on the application of mobility delivered through mobile devices and tablets. I argued that mobility could deliver a range of benefits to organizations from improved communication and better decision making to process efficiency. I also suggested that the mobility adoption would go through a maturity slope. After three years, thanks to Office 365 and Google G Suite adoption, many organizations have already achieved ‘improved communication’ and ‘improved access to information’ benefits. Employees can now access different types of resources such as documents, emails and collaboration tools from anywhere at any time, using any device! While improved collaboration and access to information are great initial benefits, the real benefits start when mobility improves the business process efficiency and finally becomes one of the essential enablers of the organizational digital transformation. In this journey, the low hanging fruit is the automation of those tasks that can be completed in the field. This automation not only reduces the manual back-office effort but also improves the quality of captured data and possibly enrichment with the data not available before such as geo-location, photos, and accelerometers. The ‘Cloud first’ strategy of many organizations has helped with further adoption of SaaS offerings and their offered mobile applications. Thanks to flexibilities offered by cloud, these applications automate tasks in the field, e.g. field inspection, customer service. The other force driving task automation is the employees’ innovation. With blurry lines between work and personal device use, many employees buy community provided applications to reduce their manual tasks, i.e. expense and timesheet management applications. Taking ideas from Open API and initiatives like the National Bank of Australia Open APIs, organizations can make their APIs available internally to drive innovation inside their organizations. 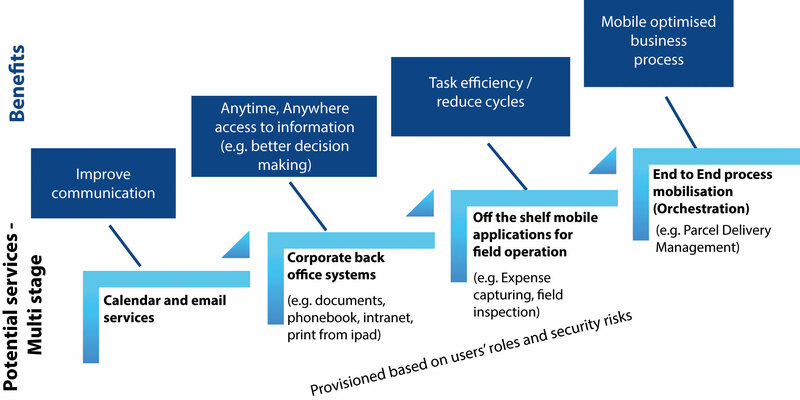 To overcome the above issues, particularly issues related to the stewardship in the organization, research firm IDC and consultancy firms recommend the creation of a cross-functional ‘mobile centre of excellence’ to organize, manage and distribute the mobile enterprise solutions and initiatives. While the creation of such forum is useful and can overcome some of the above issues, it requires representation from different business units and sufficient budgetary and authority delegation for this effort to be effective. The other consideration is the level of overlap between this forum and other committees or functions in the organization, such as innovation forums. While the automation of tasks delivers efficiency benefits to the organization and improves the employees’ productivity, these initiatives are typically tactical and do not focus on the end to end process to optimize the value generation for customers. At the end of the day, the goal is to increase the customer value and reduce wastes in its delivery. A good reference case study for the end to end process mobilization is the DHL end-to-end parcel delivery process, which included the mobile management of parcel delivery in the field. Not only this improved the whole supply chain efficiency but also it provided additional customer value by allowing the customers to track where the parcel is in near real-time. To add to these benefits, the process mobilization has also opened the door for disruptive innovation through extensive data points available through mobile and IoT devices. The real-time and mobile operation has allowed DHL to implement initiatives such as Last-mile optimization, crowd-based pick-up and delivery, and real-time local intelligence to improve operational efficiencies and customer service further. Due to the size and scale of these initiatives, such optimizations are typically part of the larger Digital transformation in the organizations. Review of an industry insight survey conducted by Enterprise Mobility Exchange shows that 27 percent of surveyed organizations consider mobility a top priority for the organization, with a larger portion (61 percent) sees a growing priority for mobility in the organization. These results are consistent with how organizations are travelling with their digital transformations, with 65 percent already formulated their digital strategy and 26 percent are in progress. On the execution, however, there are only 34 percent of the organizations that have started the implementation of their digital transformation. These suggest that mobility is an essential part of the digital transformation and its adoption is at the early state. The final word is on the critical success factors to deliver an end to end process mobilization or broader digital transformation. As shown in the diagram above, I would suggest there are four critical factors for an end to end process mobilization and digital transformation. I believe issues such as legacy architecture or information security concerns can be addressed adequately if these four factors are sufficiently focused on. The executive alignment and support is the usual suspect. Research and experience have consistently shown that initiatives that have strong executive alignment and support benefit from much stronger success. The human-centric design is the other factor that has had its success when organizations focus on customers, however, has attracted less attention in the internal process optimization. This lack of focus has arguably resulted in processes and technologies not having sufficient harmony with our employees, hence created many sub-processes built on excel and other tools around enterprise systems. While we do not have to take the same measures such as identifying the mobile moments for our employees, considering the employees’ journey and personas ensures processes and mobile applications work for people. Use of techniques such as Impact Mapping and Event storming from the Open Practice Library, provides opportunities to bring the focus on people. The third important factor in delivering the business objectives is to avoid big waterfall like planning and execution cycles. With more and more uncertainties in the technology and business landscape and shorter time to market due to hyper-competition, organizations need to take shorter cycles in planning and execution. With many innovative market entrants and disruptive technologies such as artificial intelligence, augmented and virtual reality, how a three-year strategic plan can stand valid and relevant? Is it better to spend months on making such plan perfect or do shorter cycles of Plan, Do, Check, Act (PDCA) from the familiar Lean and Agile paradigms! I know which one I would choose. The final and most important part of the transformation is the culture change. While easy to say, this is the hardest one to tackle. We as human prefer what we know which is now and our current state than an unknown future. We need to be motivated and feel secure to dare and take a step to an unfamiliar future. That is why culture change is not a bolt-on change management, but a continuous effort in the transformation and change journey to create a trust and buy-in from people. The good news is that there are good models available for organizations to learn from. Open organization concept represents a model based on the cultural building blocks of open source communities that has enabled communities to innovate and grow continuously. Organizations that their process mobilization and digital transformation are built on four dimensions of executives support, human-centric design, continuous delivery and learning and open culture have a much better chance of success in their journey.